At this time of year I’m often gripped by wanderlust and become rather sentimental for a trip I took to South Africa some years ago. I went for nearly three weeks one January and the chance to escape to the heat and glorious sunshine of the Western Cape and the Garden Route was a welcome break from the damp and gloom of Blighty. No doubt your thoughts are also turning to the holidays you plan to take this year and are thinking about exotic, sunny climes far removed from the daily humdrum. 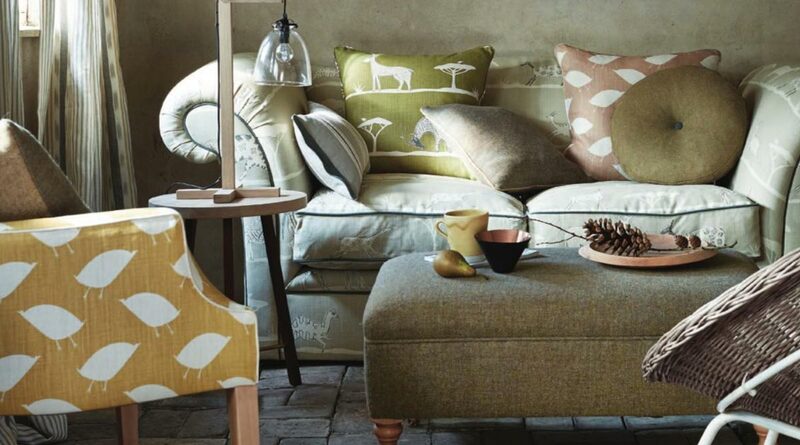 The motifs, whilst clearly fauna inspired, are subtle enough not to be overtly tribal or indigenous in design and without so much as a hint of animal print! Rather they are emblematic of hot Africa plains with herbivorous creatures and shady acacia trees. The colour range is wonderful using Charcoal, Limestone, Pigeon, Saffron, Smoke, Teal, Damask, Dormouse, Kale, Mallow, Terracotta and Tomato. So, whilst it includes warm, earthy colours they will complement the cool, grey light of our northern climate beautifully. Furthermore, at £49.50 per metre these fabrics are decidedly more affordable than a plane ticket. So, if you’re longing for some sunshine but are unable to jet off just yet, bring some of the savannah into your habitation and dream of tropical plains whilst waiting for the Winter to pass. Published in Just About Dorset magazine for January/February 2017.